Lefkada, or Leucas or Leucadia (Greek: Λευκάδα, [lefˈkaða]; Ancient Greek and Katharevousa: Λευκάς, Lefkás, [leu̯kás]), is a Greek island in the Ionian Sea on the west coast of Greece, connected to the mainland by a long causeway and floating bridge. The principal town of the island and seat of the municipality is Lefkada (city). It is situated on the northern part of the island, approximately 20 minutes driving from Aktion National Airport. The island is part of the regional unit of Lefkada. The myth about Sappho’s suicide at Cape Lefkada is related to other myths linking the island to the ancient Greek goddess of love, Aphrodite, and to Odysseus, the hero of Homer’s Odyssey. The German archaeologist Wilhelm Dörpfeld, having performed excavations at various locations of Lefkada, was able to obtain funding to do work on the island by suggesting that Lefkada was Homer’s Ithaca, and the palace of Odysseus was located west of Nidri on the south coast of Lefkada. There have been suggestions by local tourism officials that several passages in the Odyssey point to Lefkada as a possible model for Homeric Ithaca. The most notable of these passages pushed by the local tourism board describes Ithaca as an island reachable on foot, which was the case for Lefkada since it is not really an island, that it was connected to the mainland by a narrow causeway. According to Strabo, the coast of Acarnania was called Leucas in earlier times. The ancient sources call Leucas a Corinthian colony, perhaps with a Corcyraen participation. During the Peloponnesian War Leucas had joined the Spartan Confederation. The Ottomans called it “Ayamavra” (a rendering of the Greek Αγία Μαύρα, the island’s medieval name), and ruled it between 1479–1502, 1504–1684 and 1715-1716. Lefkada measures 35 km from north to south, and 15 km from east to west. Its area is 336 km2. Its highest point is the mountain Stavrota, 1158 m elevation, situated in the middle of the island. The east coast section of the island has small resorts of Lygia, Nikiana and Perigiali, all north of Nidri, the largest resort on the island. It is set in a sheltered location with views across to Skorpios—owned by Aristotle Onassis, Meganissi and other small islands, as well as the Greek mainland. The main coastal road from Lefkada to Vasiliki runs through the village, although a bypass has now been completed which skirts the village to the west. There are regular car ferries to Kefalonia, Ithaca and Meganissi. 20 km south of Nidri is the resort of Vasiliki, a windsurfing center. There are ferries to Kefalonia and Ithaca from Vasiliki. South of Vasiliki is Cape Lefkada, where the Greek female poet Sappho allegedly leapt to her death from the 30 m high cliffs. The famous beach of Porto Katsiki is located on Lefkada’s west coast. Lefkada was attached to mainland Greece. The Corinthians dug a trench in the 7th century BC on its isthmus. 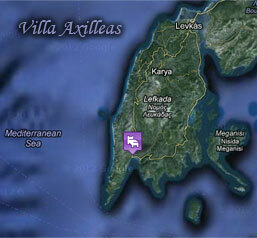 Villa Axilleas is located at the south western part of Lefkada, Greece in the town of Vasilki. Vasiliki (Greek: Βασιλική) is a town in the municipal unit of Apollonioi, on the island of Lefkada, Greece. It is situated on the south coast, 4 km south of Agios Petros and 25 km southwest of Lefkada (city). Vasiliki is a well known windsurfing spot during the summer months due to a local thermal wind known amongst windsurfers as ‘Eric’. There are often over a hundred windsurfers in the bay at any one time. The area is also popular with other sailing craft and mountain bikers. Several holiday companies operate in Vasiliki providing windsurfing and sailing equipment for their guests to use.